The Whistler Museum houses a permanent exhibition chronicling the growth of Whistler, the journey to the 2010 Olympic and Paralympics Games, and the history of the ski resort. A majestic wolf nestles in the corner of the natural history section, while in the back there is occasionally a temporary exhibit. 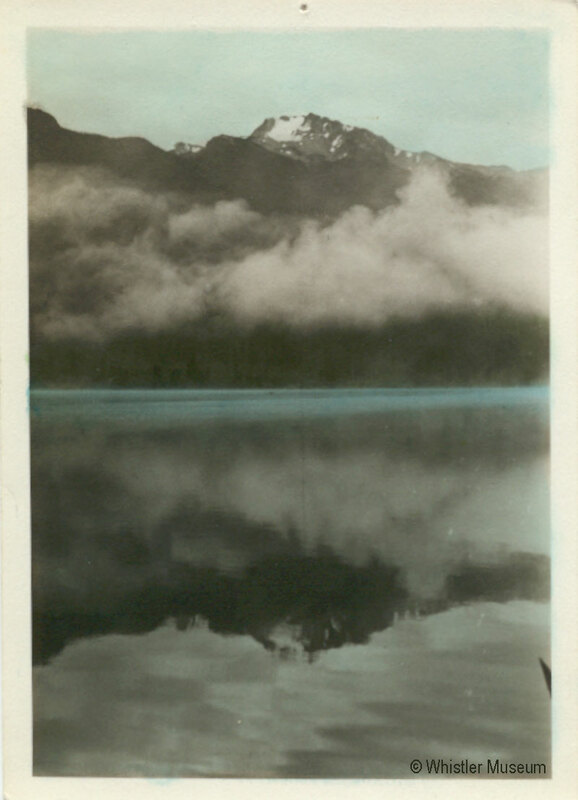 Most recently the temporary exhibit focused on Isobel and Don MacLaurin, two important figures to the Whistler scene. Items displayed ranged from a painting Isobel had done of a black bear and cubs, which was displayed in the original Roundhouse on Whistler Mountain, to Don’s 1977 award for Innovation in Education. However, there is more to this museum as it also houses the Whistler archives. But what exactly does that entail? As a masters student in Archival Studios, I often get asked: “But what are archives?” or “So what does an archivist do?” Answering these questions is not so easy. Archives, and the archivist’s role, are nuanced and complicated, and they play an important function in society, including Whistler’s. 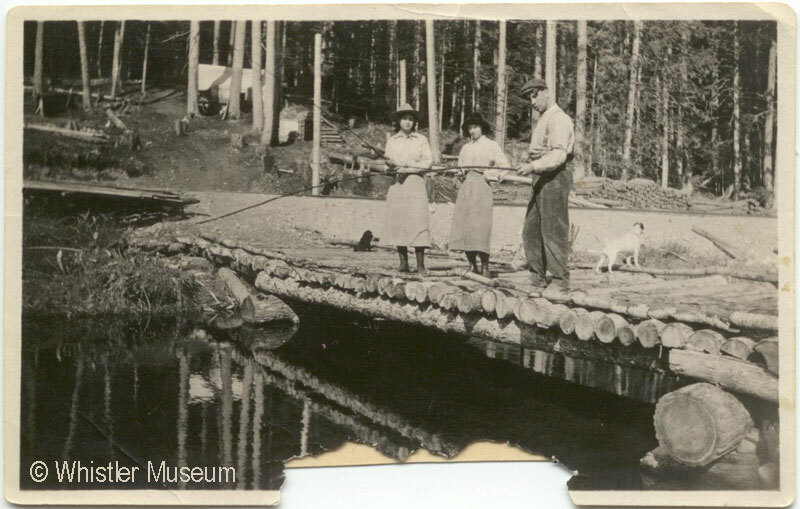 The archives room within the Whistler Museum is full of the stories of the resort town and those who have called it home. What are archives? 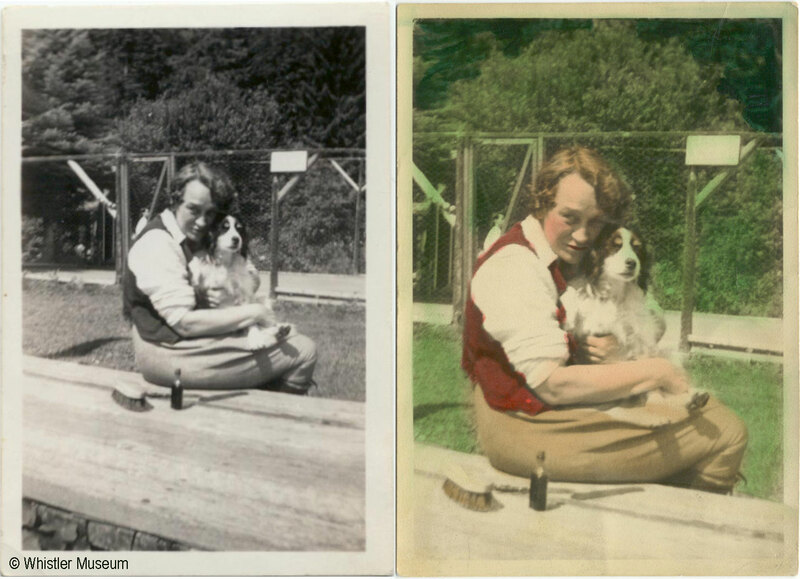 In the Whistler Museum, the archives are held in a room, a basement and a few storage containers filled with documents, photographs, artifacts, and, for the remainder of the summer, two hard-working students. Working in an archive can include many things. Appraisal, for example, is an important function that involves deciding which records to keep and which ones don’t fit within the archive’s mandate. 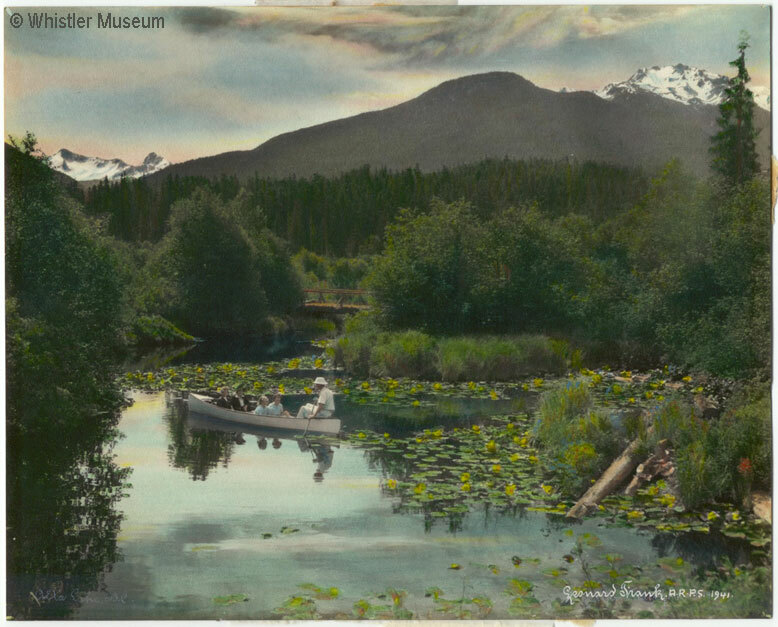 Th Whistler Museum and Archive’s mandate is to collect, preserve and interpret the natural and human history of mountain life, emphasizing Whistler. This mandate gives us a broad scope around what to acquire or keep to accurately represent the town’s rich heritage. There is also arrangement and description – this consists of arranging records in structures that represent them best and makes it easy for researchers to review them. Artifacts are photographed from all angles and described in detail before being prepared for storage or display. In a society, archives preserve history and aim to be as accurate and representative as possible about the community they represent. 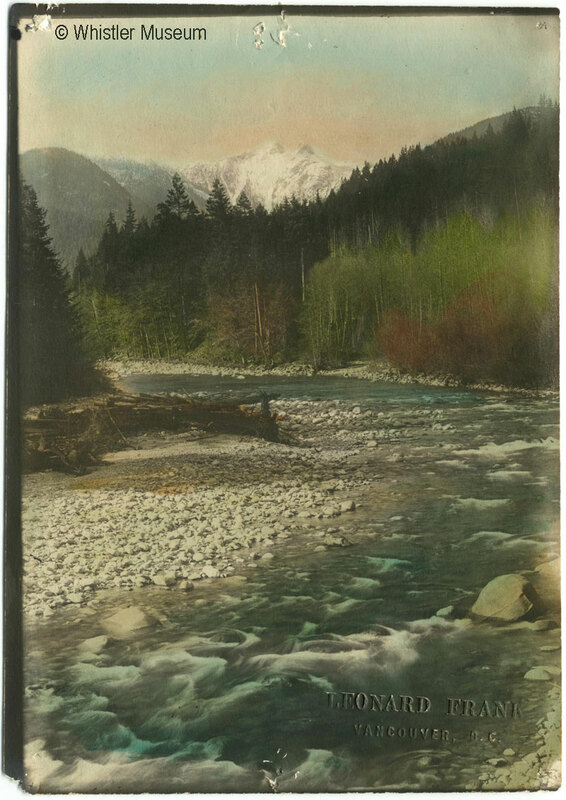 In a town like Whistler, archives contribute to building a solid foundation of civic pride in our shared heritage. They show us how far we have come from the Rainbow Lodge days, the monumental effort that brought the Olympic and Paralympic Games to Whistler in 2010, and generally instill a sense of pride in the tireless individuals who brought to life the Whistler we all know and love. When I meet people in Whistler and the topic of work comes up, I talk about Whistler’s wild history and how awesome it is to work with every day. I also bring up the challenges of the job: as a non-profit, we fight with our pens each year to maintain a budget for operating through grant writing and presentations. History marches on and collections inevitably grow; we are bursting at the seams in terms of storage in our portable behind the library. The archives stored on-site at the museum are packed with boxes, binders, and Alyssa, our collections manager. We are balancing the storage issue with wanting to represent as many of the subcultures in the Whistler community as we can. This town changes fast – evidence of places, people and events from even 10 years ago have already been wiped from the landscape (The Boot, for instance). If potential donors believe only Myrtle Philip and the Crazy Canucks are “old enough” to be considered history, the evidence of more recent events will be lost before anyone gets a chance to donate related items. I’ll give you a step-by-step process of what happens when you donate in the hopes that perhaps you might consider it an option. The process of donating involves bringing your items, documents, films or photographs into the museum and signing a donation form in which you’re able to give us historical context for what you’re donating – maybe “worn on Gaper Day in 1995” or “photos from shows at Alpenrock”. Our mandate allows us to accept any item that is related to the Sea to Sky region (though we prefer receiving things relating to the Whistler community!) and items that demonstrate mountain culture. We then give each individual item of our donation an accession number that acts as its own unique identity. For an artefact (any physical object), a lot of physical description is necessary (object type, year of creation, years of use, dimensions, colour, material, geographic origin, condition, and so on). We photograph artefacts from all sides, capturing details like inscriptions on the back. Artefacts are photographed from all angles and described in detail before being prepared for storage or display. All of these descriptions and photographs go into one catalogue record for each artefact. This catalogue is searchable, so that if we want to find “Whistler Mountain pins” we can view all artefacts that were described this way. Before storing artefacts, we make sure they’re cleaned of dirt, mould or anything else that might degrade their condition in storage. Cleaning artefacts requires much care that we do not damage the object. We often use brushes, cloth and lightly soaped water. The artefacts are then wrapped in acid-free tissue, placed in acid-free boxes and placed on a shelf in our off-site storage. For archival donations (written documents and media), content is more important than physical appearance. We describe an item’s physical appearance in a catalogue entry and tag the catalogue entry with “access points” – subjects, places, people and organizations related or pictured – so that we can search for all the items related to a certain topic. You can even search at home at whistler.ica-atom.org. Archival donations are stored on-site at the museum because we often receive requests for certain texts or photos to be digitized. Digitization requires a massive amount of computer storage, two very expensive scanners and a lot of employee time. Our Collections Manager Alyssa strives to organize, catalogue and digitize our ever-growing archive. If you’re interested in having your own items go through this rollercoaster of historical processing, come by the museum! We’re especially looking to fill gaps in our collection – mountain biking, summer activities, restaurants, and 1996-2010. Canada Day was an absolute blast in the village and at the museum! Andy Petersen and Sarah Drewery enjoying a rest. This year, the theme for the parade was Earth, Wind Fire and Water. In true museum style, we decided to attack the parade theme by blending it with a little bit of history. 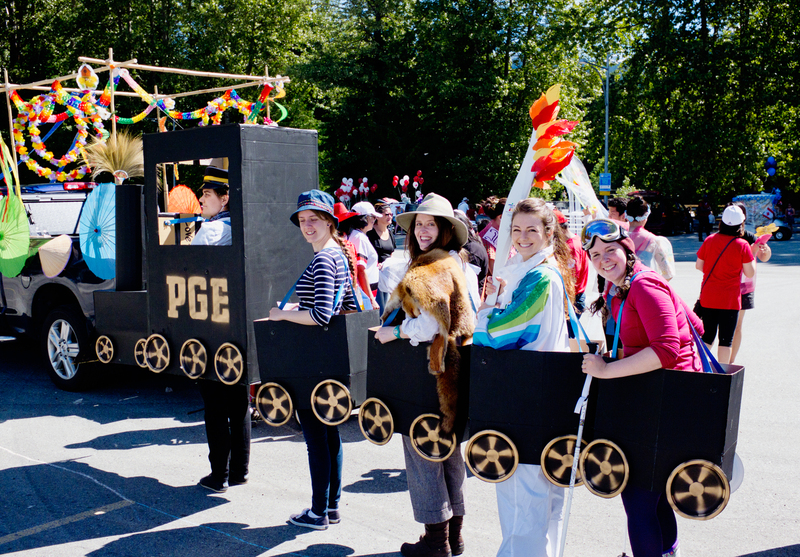 This year marks the 100th anniversary of the PGE Railway to Whistler; thus, we decided to build a cardboard train as our float. Oh sure, no problem, a cardboard train to fit five humans, no big deal! Not quite. Original design flaws and general limitations made for an intensive week of construction. Alas, we prevailed and our tireless efforts certainly paid off after seeing the enthusiasm from children and adults alike. The museum crew in full attire. The Canada Day parade was also a great opportunity for us to talk about the actual PGE (Pacific Great Eastern) Railway, which is a remarkable piece of Whistler’s history. 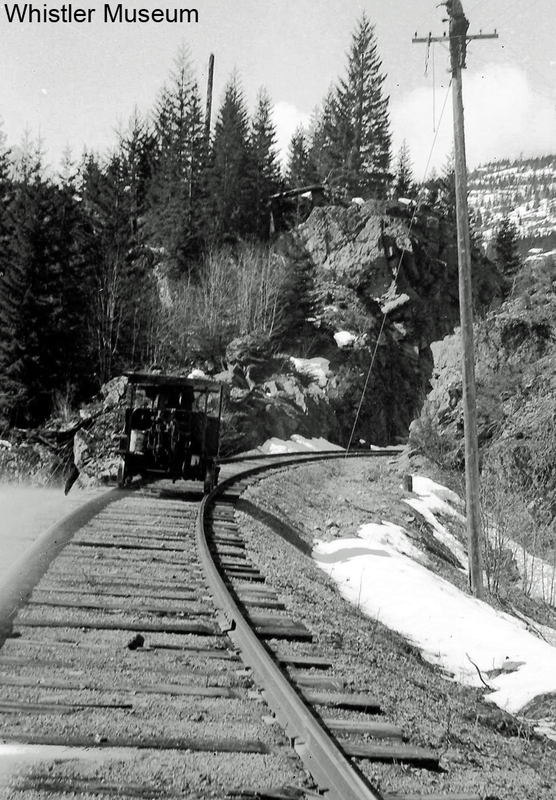 As you could imagine, it was no easy feat traveling to Whistler over 100 years ago before the train. In fact, before the railway laid its tracks to Whistler, it would take three days–two of which on foot–to make the trip from Vancouver. This three-day journey consisted of taking a steamship from Vancouver to Squamish, followed by a horse-drawn buggy a few miles north to Brackendale, until finally renting packhorses and walking the rest of the way along the Pemberton Trail. 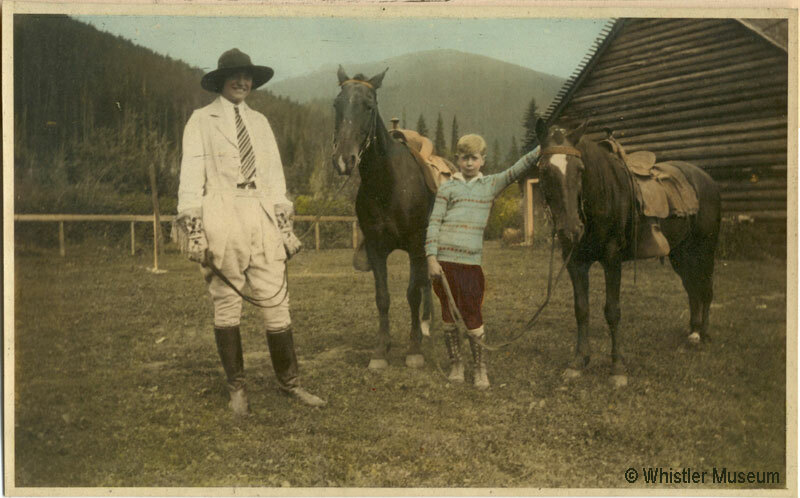 Let’s just say the population of Whistler (known as Alta Lake at the time) was much, much smaller then. 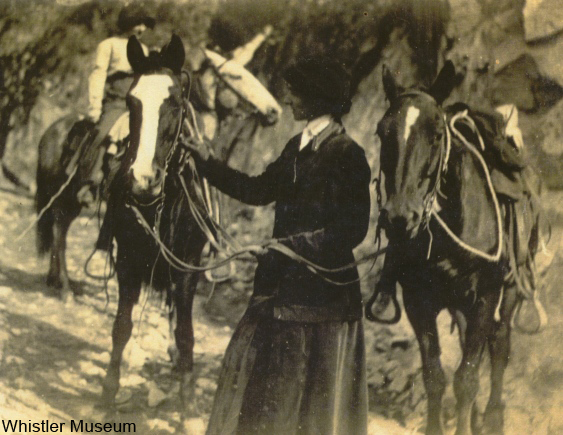 Grace Woollard traverses the Pemberton Trail to Whistler in 1912. Cue the PGE Railway in triumph! Backed by the provincial government, the PGE was underway in 1912. Contractors Foley, Welsh & Stewart were hired to build the track from Squamish to Prince George. A ribbon of land 100 feet wide plus 15 feet for sidetrack was cleared. 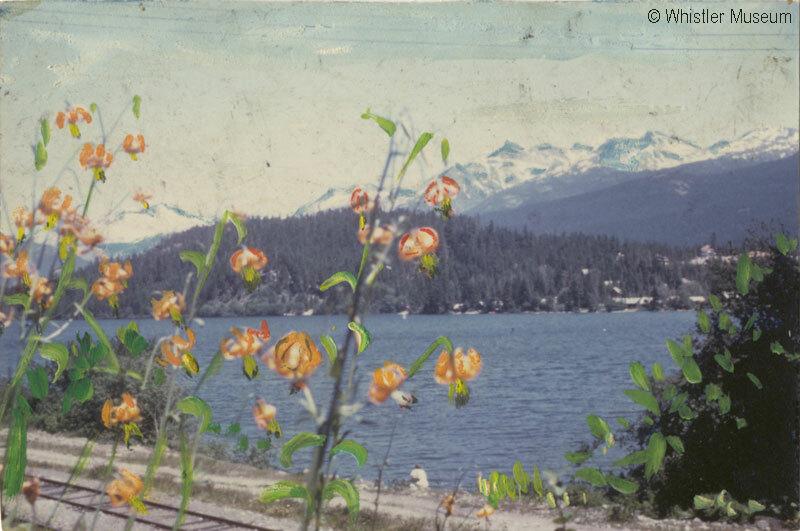 The PGE was open and running by October 11, 1914, making Whistler much more accessible. Speeder on the PGE Railway. A very interesting thing to note about the PGE is its inapt acronym. The railway could not really be considered pacific, great, or eastern. This baffling cipher allowed the company to acquire many unofficial names, such as Please Go Easy, Past God’s Endurance and Prince George Eventually. To commemorate the 100th anniversary of the PGE Railway to Whistler, Sarah Drewery (Executive Director) will continue featuring stories of the train in her weekly Question Newspaper article throughout the year. Stay tuned! On Friday June 13th the Multicultural Festival will be held in the Florence Petersen Park between the Whistler Library and the Whistler Museum. 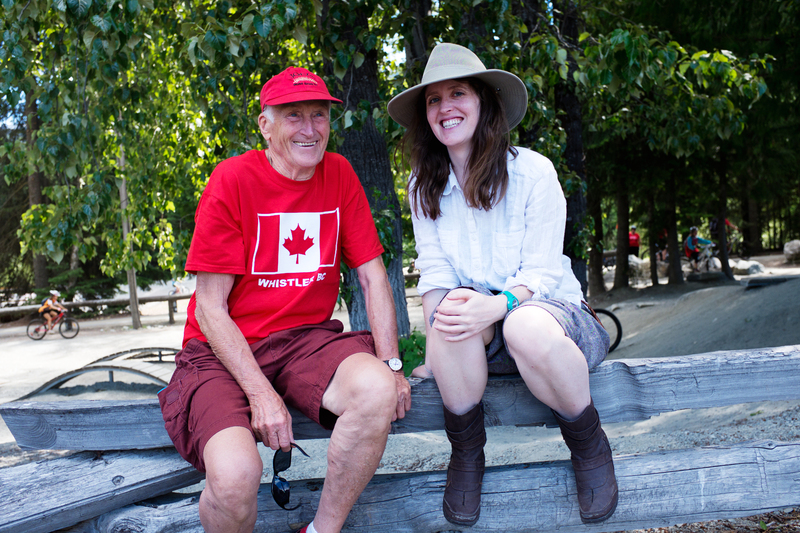 This event is a delightful way to learn about the many corners of the world the people of Whistler have originated. The festival is free and open to the public. There will be performances, food, music, games, and arts and crafts all happening between 4 and 8pm. A group from the SLCC perform during the opening of the 2013 Multicultural Festival. Photo courtesy of the Whistler Multicultural Network. Whistler has always been a place for people from all over the world. It has developed into what we see today through the multicultural influences of not only its first settlers – such as Myrtle and Alex Philip, who were Americans from Maine, and Polish John Millar – but also everyone who has followed in their footsteps. Myrtle hunting at Mahood Lake. 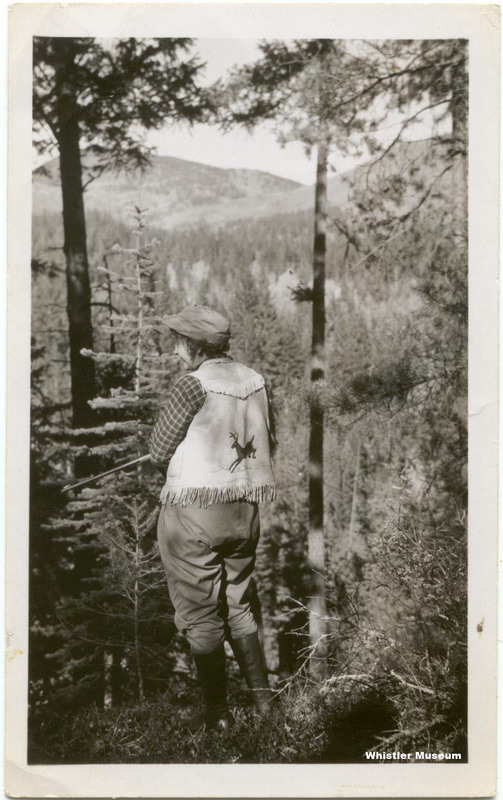 This includes individuals such as Billy Bailiff a trapper from Cumberland, England who wrote about the importance of preserving Whistler’s environment in the local newsletter. 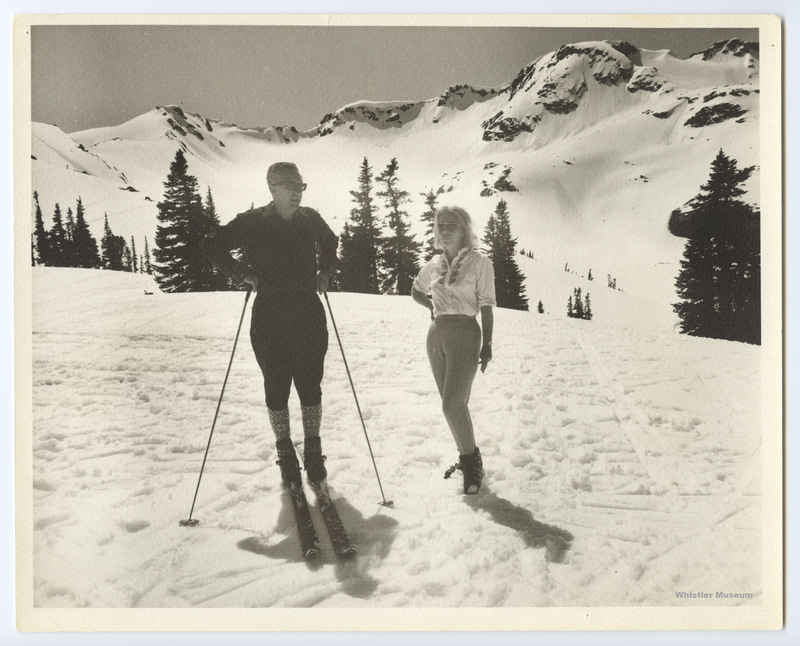 And then in later years, skiing was brought to the valley by a variety of people, many of which came from European countries where skiing was a popular sport – such as Switzerland and Austria. A great example of this is Franz Wilhelmsen, a Norwegian who became the first President of Whistler Mountain. 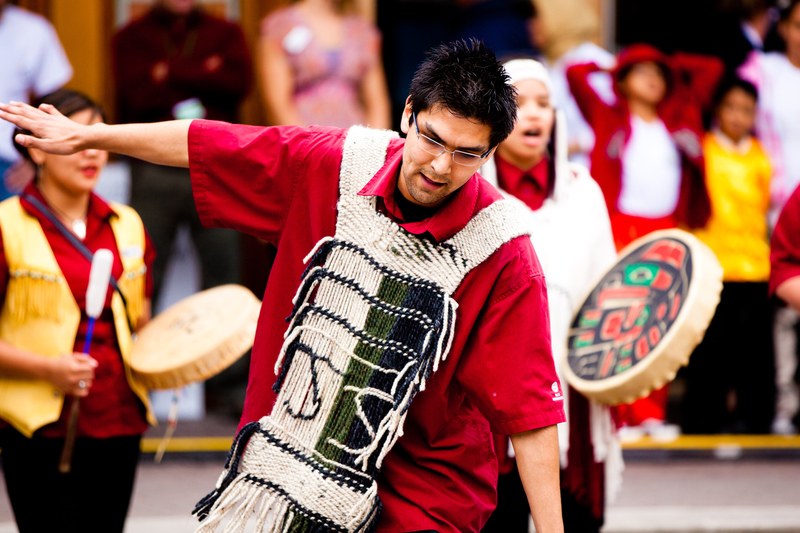 The Whistler Museum will be open by donation for the duration of the Multicultural Festival. Franz Wilhelmsen (left) at the top of Whistler looking toward the peak. As cliché as it is to say, photographs really do have the ability to speak a thousand words and tell of a million adventures. While exploring our Philip Collection here at the museum it’s impossible to ignore the consistently smiling face of Myrtle Philip. Never have I seen a person’s character brought so vividly to life through photographs as I have through these images of Myrtle. 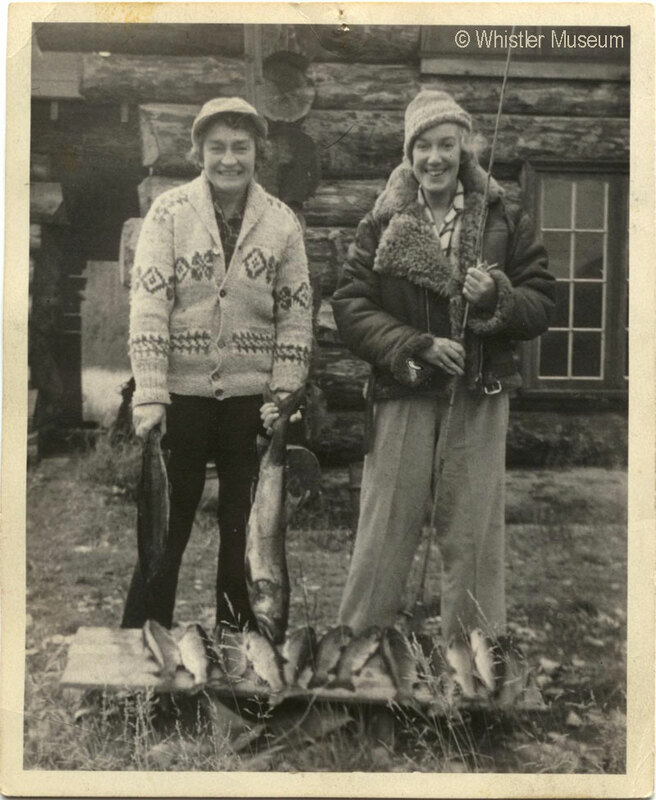 Although not a mother in the typical sense, Myrtle brought life to Whistler and was truly an amazing woman. 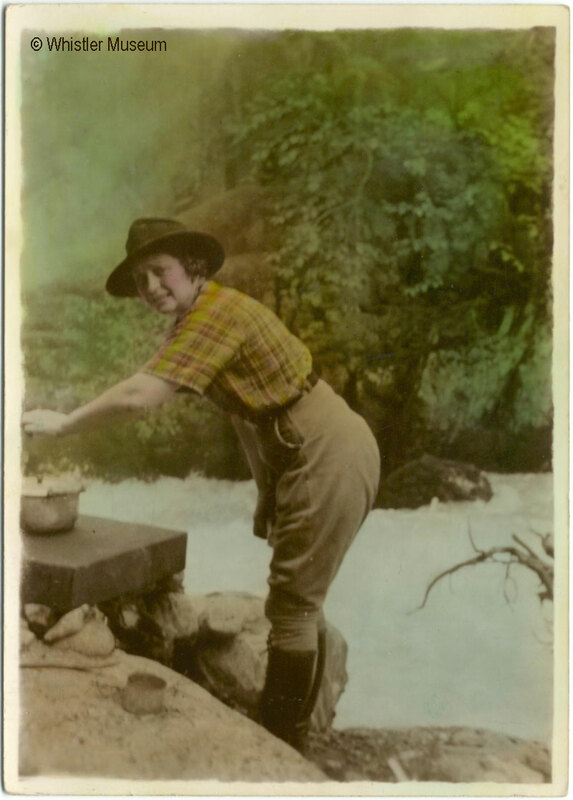 For this, what better time than Mother’s Day to share some of those powerful photographs of one of our valley’s most influential women?